I took the bus to work this morning, having ridden to work yesterday but gotten a ride back across the bridge in the afternoon for a meeting at the agency. Surprisingly empty bus, given the price of gas! But I guess I was pretty early. Yes, it did take over 90 minutes to get to my desk, much more than the 25 it takes me by car. So I can see why people don't want to do it. But it was simple and I did get some reading done. During the day my eyes felt tired and a little weird. 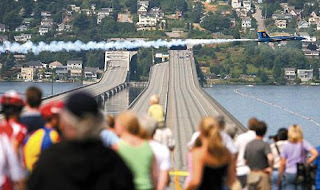 But with the bridge closing for the Blue Angels show again today, I either had to make it to the bridge by 12:15 (meaning leave my desk by 11:45 at the latest) or stick it out until after 3. Well, I hemmed and hawed about it, but at 11:30 I decided to go for it. And then promptly got drawn into a conversation with someone. So at 11:48 I ran for the stairs, trekking across the TMO campus, changing clothes, and racing to my bike. I had no idea how long it would take me to get to the bridge because I had NEVER RIDDEN ACROSS IT. Fun, eh? So on to the path, and out towards the bridge. Up and down the rolling hills, getting completely breathless and times and even having to stop and push my bike. (Yikes!) When I got to the park and ride, there was no one waiting for the bus so I decided that I must have just missed one, so pushed on. Up and down some more hills. Crowds were starting to gather in the park, making riding difficult. I just kept thinking that I would get stuck on the bridge and have to wait. Finally, I got to the bridge -- with minutes to spare. Actually, 15 minutes, as they were allowing bikes to cross until 12:30. Good thing I didn't know that! The ride across the bridge itself was a little scary -- more pedestrians than usual, of course, and most of them completely oblivious. A few desperate cyclists trying to make their way across. And the wind. But I made it across... and then wasn't sure which way to go. Found my way into the tunnel, then on to a faintly marked cycle path. There sure are a lot of hills on that trail. I know I need to get more comfortable on hills, but sheesh... The worst part was the trail abruptly ending and turning into a narrow sidewalk. I must have missed a turn... though a couple of other cyclists ended up behind me at the point, so maybe it *is* the trail. Then down towards the stadium and into Pioneer Square. Visited Eric at his bike shop briefly, made a date for Silver to see the doctor, and then.. well... I punted. My legs felt a bit jellyish so I decided to put the bike on the bus. I did get off the bus at 15th and Leary and rode the rest of the way home, but it was a pretty weak display. I'll have to work up to riding the whole distance home.